This canvas is a fine quality, triple acrylic primed 380gsm cotton canvas. Suitable for use with oils and acrylics. 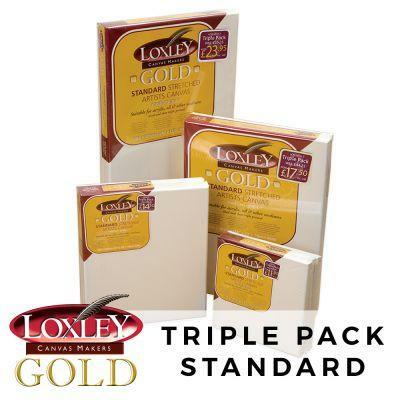 Canvases are polywrapped in a pack of 3 canvases. The triple packs are available in 4 sizes. Minimum order is 2 packs of any size. Size of each pack can be different. Limited stock, only available while stocks last. Amazing prices for the 3 canvas packs. Excellent special offer! - Loxley Gold Standard Canvas Triple Pack 12"x10"
Amazing value - canvas great but stretchers a bit thin.